Ben Duckett is relishing the prospect of making his second appearance for England Lions on home territory – even if he has given himself a very tough act to follow. The 21-year-old cracked a stunning unbeaten 163 on his Lions debut against Pakistan A in Cheltenham on Tuesday, an innings that wowed his team-mates and coaches alike – and has been beaten only once in 50-over cricket by a Lions batsman in the decade since the England A team were renamed in 2006. Ravi Bopara still holds the record, with 168 against West Indies A at Worcester in 2010, but Duckett’s effort surpassed the 158 made by Ian Bell the same year against India A, also at Worcester, and the remarkable unbeaten 151 smashed by Ben Stokes against South Africa A in the Pretoria township of Mamelodi in January 2015. So he has become only the fourth batsman to score more than 150 for the Lions in a 50-over match, putting him in some pretty distinguished company. On Wednesday afternoon he was back practising in Northampton, ahead of the Lions’ first meeting with Sri Lanka A in the Tri-Series on Thursday – a day-night match starting at 2pm at Wantage Road, and free admission for any cricket lovers keen to watch Duckett and the rest of England’s bright young things. “It’s nice to have got runs in the first game so I’m feeling in form and I can just go and play with freedom at Northampton,” said Duckett, who was born in Kent and went to junior school in Somerset, but has been in the Northants system since his teenage years. 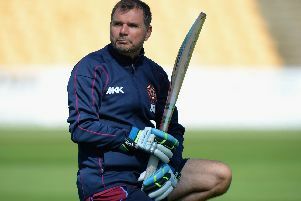 He credits the Northants coaches, headed by David Ripley, a major influence since those early days, for his successful 2016 – especially in 50-over cricket. “The main thing that’s changed is the opportunity I’ve had batting at the top of the order,” he explained. “I’ve always been seen as a finisher playing the scoops and all that sort of stuff, batting down the order at six or seven, coming in with 10 overs left. But this year in the one-day cricket I’ve been batting three for Northants and got used to it. So when the early wicket fell in the Lions game I was used to it. And you can get off to a flier in 50-over stuff in the first 10 overs. “Before I batted I was sitting in the dugout chatting to a few of the guys just trying to calm myself as if I was playing for Northants. “Obviously when you’re walking out you are thinking it’s your Lions debut, and it is a bit different. “They’d taken an early wicket and the ball was doing a little bit. But as soon as I got a couple away it relieved a bit of pressure. Perhaps it helped that Duckett’s partner in an important second-wicket stand was Daniel Bell-Drummond – who he was known since they were 10-year-olds batting together at Millfield. “At Millfield it used to be Deebs whacking it and I couldn’t get it off the square,” he added. A perfect Tuesday for Duckett, whose parents were in the Cheltenham crowd, was completed when the Steelbacks shrugged off his absence to beat Birmingham Bears in a televised NatWest T20 Blast fixture, and book their place in the quarter-finals. But he is still keen to link up with the Steelbacks, after his second Lions appearance, for their Blast game against Yorkshire Vikings at Headingley on Friday – when they hope to secure a home tie in the last eight. That means Duckett will face one of the longest journeys of the Lions players, who have been made available to play for their counties on Friday before regathering in Canterbury on Saturday ahead of the last two games of the Tri-Series on the following two days.